Chapter 1 delves into the phenomenon of politicians, pundits, and religious leaders whose beliefs are mainly expressed in the form of attacks against those who disagree. Chapter 2 proposes a uniquely Talmudic idea that would all but eliminate medical malpractice lawsuits that make medical care far less costly. Chapter 3 discusses whether the USA should make English the US’s national language. Chapter 4 offers a very specific approach to abortion policy that concurs with neither the Pro Life nor Pro Choice camps in the US. Chapter 5 explains why a person’s or a movement’s extreme fervor, even for a righteous cause , can evolve into a terribly destructive force. Chapter 6 advances a concept that could lead to a massive reduction in the military budget, while at the same time, actually strengthening the US military. Chapter 7 deals with why liberals are liberal about all ideas and all people…except for those that are not liberal. It then further examines the phenomenon of the highly biased liberal press. Chapter 8 discourses on whether US troops should be dispatched to stop a slaughter taking place in a Third World country. Since some soldiers will die in the process of preventing the deaths, is this proper? The Addendum discusses the related question of whether the US should in any way help rebel forces overthrow a dictator. Chapter 9 spells out a highly effective approach to making the US safe from terrorist attacks. Its Addendum is about defending the US against another type of deadly assault – Chinese computer hacking. This chapter, however, was deleted from the book – at least from its first release – due to the controversial nature of its suggestions. Chapter 10 discusses how a country (such as the USA) and its citizens can grow prosperous and wealthy. Chapter 11 explains why, by definition, government management of almost anything (such as health care) will be terribly inefficient and wasteful. Chapter 12 dissects the bizarre “Something for nothing” mindset, the notion that something can be acquired for free and without real consequences. An example is a government that continues accruing unpayable debt as if the money borrowed will never have to be repaid. Chapter 13 outlines a Talmudic approach to taxation. Chapter 14 presents a precise definition of what in a society should or should not be governed by government. Chapter 15 outlines a policy on the illegal immigration to the USA. Chapter 16 outlines a practical and piecemeal approach to implementing this book’s ideas. The Epilogue is of a different character from the rest of the volume. 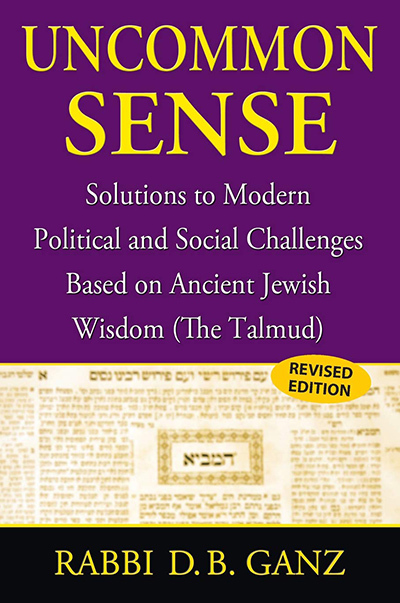 It articulates a Talmudic view on how people can attain enduring inner contentment and happiness.